MARQUETTE — The Marquette City Fire Department is made up of 24 fire suppression specialists. And when fighting a fire, things can certainly change in the blink of an eye. “With the way structures are built now and with the items we have inside, quite often things can escalate real quickly,” said Capt. Jeff Green of the Marquette City Fire Department. 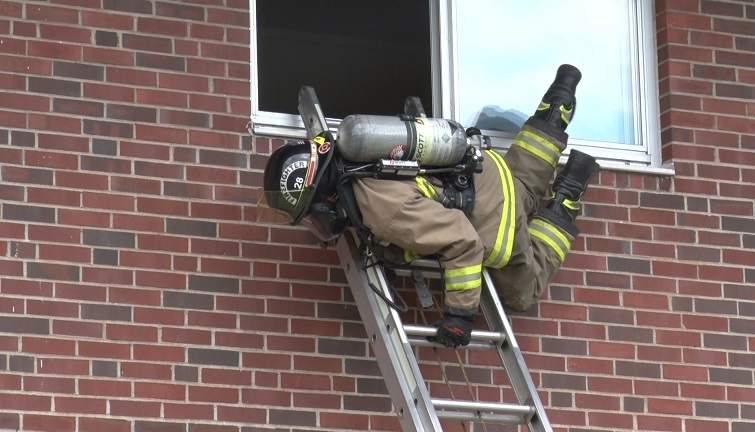 Firefighters spent Wednesday practicing self-rescue techniques and bailouts from the first and second story of a building. “We throw ladders in upper stories more for our own use and escape. If things escalate to the point where we need to exit rapidly, quite often stairwells are closed off where we can’t get out that way, so you need to be able to get down a ladder quickly,” said Green. The training sessions all take place at the Summit Street Apartments that Northern Michigan University is demoing. And use of the buildings gives firefighters the chance to really practice those skills and techniques. “We don’t have a lot of fire experience any longer, which is a good thing. But from our standpoint it’s a bad thing because we don’t get to use these techniques enough to really be proficient at them,” said Green. “A lot of our newer members haven’t had the opportunity to experience the type of situations that we run into with major structure fires, so this gives them the opportunity to train. The department has also spent time conducting smoke training plus search and rescue training at the site,” he added. Dia de Los Tacos wins best taco in U.P.